Description: The F-8A Supercritical Wing (SCW) aircraft in flight. Dr. Richard T. Whitcomb began work on the supercritical wing in the early 1960s. Although the design was highly efficient in wind-tunnel testing, it was so unusual that few accepted the concept as practical. Larry Loftin of NASA's Langley Research Center in Hampton, VA, said, "We're going to have a flight demonstration. This thing is so different from anything that we've ever done before that nobody's going to touch it with a ten foot pole without somebody going out and flying it." The Navy supplied NASA with an F-8A (Navy Bureau Number 141353/NASA tail number 810), while North American Aviation built the supercritical wing. The SCW team attached it to the stock F-8 fuselage. This 1971 photo shows its original paint finish. Tom McMurtry, who was the lead project pilot, recalled that there was no time or money for a fancier finish. 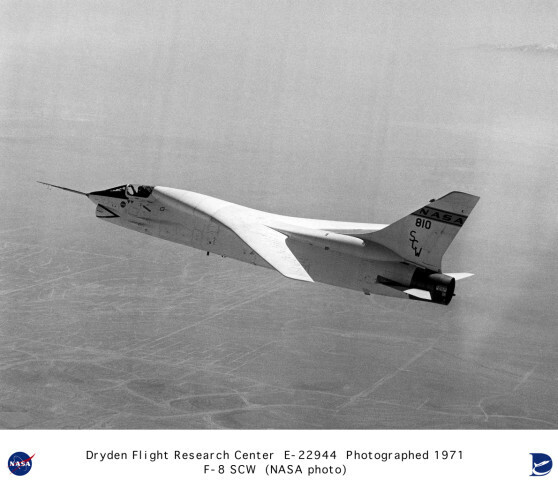 In fact, on the first flight, made on March 9, 1971, the "SCW" on the tail was actually taped on. Keywords: F-8A Crusader; Supercritical Wing; Dryden Flight Research Center; LTV Aerospace; Rockwell International; Pratt & Whitney; J57 engine; turbojet; transonic; Dr. Richard Whitcomb; John McTigue; Tom McMurtry; Ron Gerdes; Larry Loftin.